Graphene oxide flakes interacting with cell membranes. ﻿Researchers have used graphene to target and neutralise cancer stem cells while not harming other cells. This new development opens up the possibility of preventing or treating a broad range of cancers, using a non-toxic material. 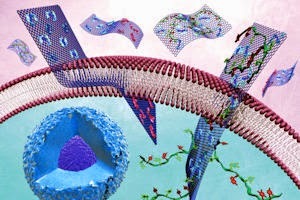 Published in the journal Oncotarget, researchers have shown that graphene oxide, a modified form of graphene, acts as an anti-cancer agent that selectively targets cancer stem cells (CSCs). In combination with existing treatments, this could eventually lead to tumour shrinkage as well as preventing the spread of cancer and its recurrence after treatment. However, more pre-clinical studies and extensive clinical trials will be necessary to move this forward into the clinic to ensure patient benefit. The team prepared a variety of graphene oxide flakes for testing against six different cancer types - breast, pancreatic, lung, brain, ovarian and prostate. The flakes inhibited the formation of tumour sphere formation in all six types, suggesting that graphene oxide can be effective across all, or at least a large number of different cancers, by blocking processes which take place at the surface of the cells. The researchers suggest that, used in combination with conventional cancer treatments, this may deliver a better overall clinical outcome. It also shows that graphene oxide is not toxic to healthy cells, which suggests that this treatment is likely to have fewer side-effects if used as an anti-cancer therapy. Graphene has the potential to revolutionise a vast number of applications, lighter, stronger composites to flexible, bendable electronics. Graphene oxide can be used to create membranes that can coat surfaces to prevent corrosion, or filter clean water in real time. Demonstrating the remarkable properties of graphene won the Nobel Prize for Physics in 2010.